The final deadline for underground storage tank (UST) owners and operators to meet new federal requirements from the U.S. Environmental Protection Agency (EPA) for spill, overfill and corrosion protection is Oct. 13, 2018. By that date, UST owners and operators must fully comply with the agency’s latest UST regulations, which took effect on Oct. 13, 2015. This is the final deadline of the three-tiered process. The exact steps UST owners and operators must take — and who they must report to as part of the compliance process — vary based on location. Once state agencies adopt and/or develop UST regulations in accordance with EPA requirements and put other components of a program in place, states may apply for formal approval. The EPA must respond within 180 days. Each state plan is approved if it meets a range of criteria, including the establishment of standards for eight performance criteria that are no less stringent than federal rules; provisions for adequate enforcement; and regulation of at least the same tanks regulated under federal standards. 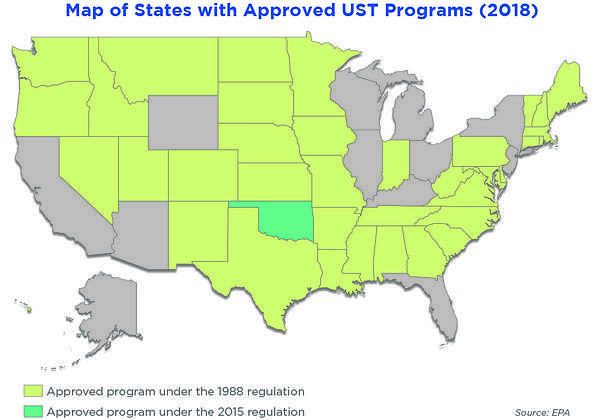 Once approved, states have the lead role in UST program enforcement. That means UST owners and operators in states with an approved program do not have to deal with two sets of regulations — state and federal — that may be conflicting. In states without an approved program, the EPA works with state officials in coordinating compliance. Thirty-eight states, the District of Columbia, and the Commonwealth of Puerto Rico had approved programs as of Sept. 1, 2018. Those states must reapply to retain their approved-program status by Oct. 13, 2018. As part of that application process, the state must demonstrate “adequate enforcement” procedures by showing how it enforces the technical regulations for any asset owner or operator not in compliance. In those states, UST owners and operators work with state authorities to show compliance for their assets. In states and U.S. territories without program approval, owners and operators must work with both state and federal authorities. The rolling implementation schedule for the 2015 UST regulations’ final deadline for compliance is reaching its conclusion. The following requirements have a compliance deadline of Oct. 13, 2018. Operator training: UST operators must designate and train Class A, B and C operators and maintain a record of their training. Class A: Must be trained to make knowledgeable decisions related to UST compliance and ensure that the appropriate individuals are completing proper operations and maintenance (O&M) and record-keeping requirements. Class B: Must be trained to implement applicable UST regulations related to typical UST systems (or the UST system at the facility). Class C: Must be trained to take appropriate actions in response to UST spill emergencies or alarms. O&M requirements: Every 30 days, a walkthrough inspection must be completed for the spill prevention equipment, release detection equipment, containment sumps and handheld release detection equipment. Records for the most recent year’s inspections must be maintained. Overfill prevention equipment inspections and spill prevention and containment sump testing are required every three years, with records maintained for the last three years. (In the latter case, either the spill and containment sump equipment must be tested or double-walled spill prevention and sumps are monitored at least as frequently as the walkthrough inspections.) Finally, release detection equipment must be tested annually, and records must be maintained for the last three years. Previously deferred UST systems: These systems (field-constructed tanks, airport hydrant systems, wastewater treatment systems and some emergency generators) are now required to perform release detection. Vapor/groundwater monitoring: Records of site assessment (vapor/groundwater monitoring results) must be maintained for as long as vapor/groundwater monitoring methods are utilized as release detection. Owners and operators will need to begin meeting these standards and conducting the necessary inspections and tests in accordance with local requirements. Additional information is available from the EPA, and we stand prepared to assist with all your environmental compliance needs. Our professionals’ experience, including USTs, extends to all aspects of environmental health and safety (EHS) compliance programs. Learn more about how we can help. Matt Shanahan is an environmental compliance specialist and project manager at Burns & McDonnell. With more than 15 years of experience, he specializes in hazardous and solid waste management for industrial clients. Matt also has served as a compliance auditor on numerous multimedia environmental compliance audits for utility and industrial clients.